Despite American reality TV show ‘Man V Food’ only being shown on relatively small channels Dave and Good Food in the UK, it has built up something of a cult following. Viewers were drawn to watch the adventures of host Adam Richman as he travelled America to take part in ‘big food’ challenges. Sometimes eating extremely hot foods such as the ‘Suicide Wing Challenge’ where he took on a plate of wings coated in Ghost Chili sauce but more often than not involving seriously large quantities of food, like an insane 72oz steak with several sides. Proving that level of extreme eating is definitely not a recommended lifestyle choice, Adam has lost an amazing four stone in weight since quitting the show in 2012! His legacy lives on in certain Manchester restaurants however, where Man V Food style dishes and even challenges are readily available. Popular burger joint Almost Famous are now actually famous thanks to their original and often extremely large creations. People queue for hours to get their hands on burgers that can be packed full of anything from flat iron steak to Monster Munch crisps! SoLita seem to be on a mission to come up with the biggest burger. 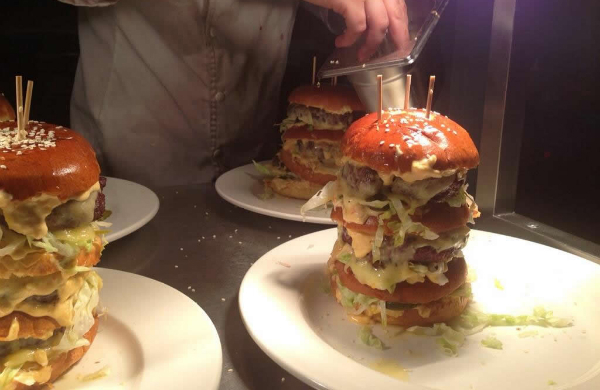 The ‘Once In A Lifetime’ sees their regular beef patty piled high with pulled pork, fried chicken and onion rings while they’ve also created the ‘Big Manc’ and ‘Mega Manc’ - a giant sized version of the famous McDonalds burger. It’s not just extreme quantities either - their menu also contains a variety of chicken wings available in a range of heats from ‘Smiling ‘ through ‘Sizzling & Screaming’ to ‘Stupid’. The hottest is named ‘Cry for Help’ which I know only too well after competing in and winning the SoLita In The Street Hot Wing Challenge* last summer. Other challenges include the 'Tapout Burrito’ at Luck, Lust, Liquor & Burn, a huge burrito stuffed with crispy beef, pulled pork, chicken, fries, cheese, rice and all sorts of other ingredients. It’s then topped with various sauces, onions and guacamole! Nine out of ten people end up ‘tapping out’ and fail this particular challenge. Barbeque restaurant Southern Eleven also run regular extreme eating contests, like the recent ‘Meateasy’ - a monster sandwich containing a kilo of meat including three burgers, sausages and pulled pork as well as fries and coleslaw. Their latest challenge is a combination of both big and hot. Contestants must eat their way through a monster 20oz burger and fries as well as 10 insanely hot suicide wings! While over at Pie & Ale in the Northern Quarter it’s all about eating pies. The challenge is to finish 3 freshly baked hot pies with sides, which works out at over 3.5lbs of food in less than 10 minutes! So whether you want to compete like Adam Richman or just attempt some Man V Food style dishes without an audience you don’t have too look too far. *more info http://foodgeekblog.co.uk/2013/05/solita-in-the-street-hot-wing-challenge-champion/ Have you ever competed in an eating competition? Tweet us! 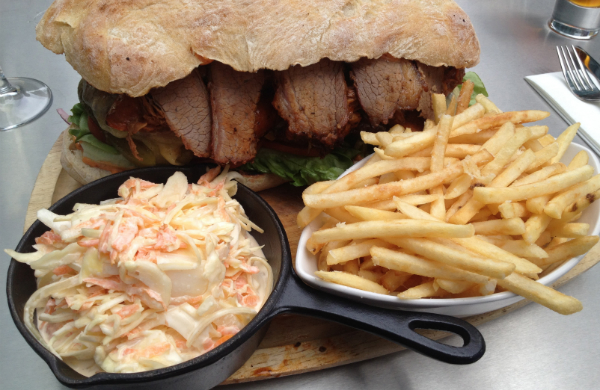 @Groupon_UK #grouponguide ____ Check out our deals for restaurants in Manchester.